Cute cup with matching saucer made by Stetson china. Pretty hand painted pink and charcoal grey plaid pattern. 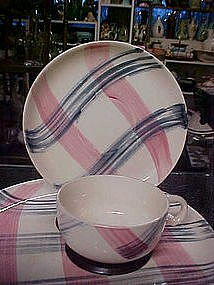 I have 7 sets available, and price is for one cup with the matching saucer. All are in perfect condition. I have other pieces listed to this pattern.